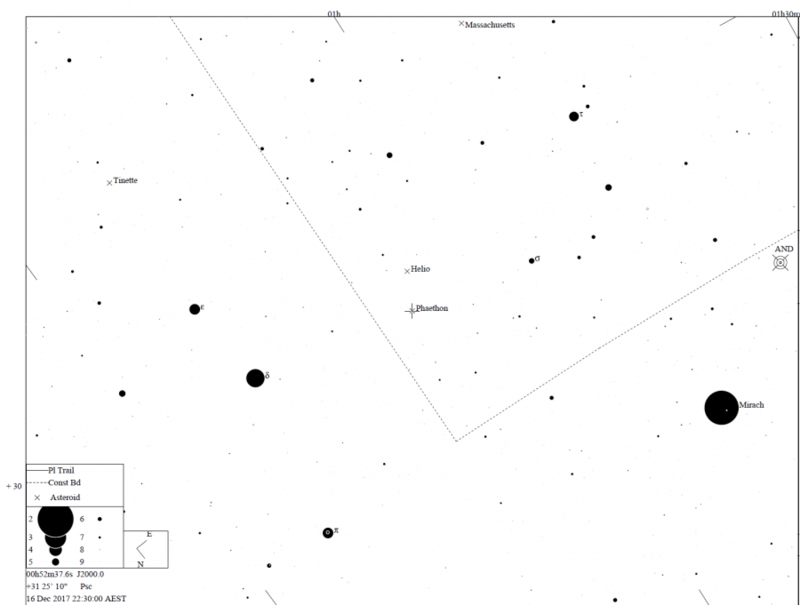 Asteroid 3200 Phaethon, the size of a rural hamlet, will pass within 10.3 million kilometers from Earth at 10:00hrs AEDT on December 17th, a daytime close approach for Southern Hemisphere observers. Just before closest approach, it will reach magnitude 10.7, bright enough to track in a 3-inch telescope. Phaeton will be scooting along at up 15° per day or 38″a minute — fast enough to cross the field of view like a slow-moving satellite. You need to have an excellent North viewing position, it is too low in Ballarat to see easily. The further North you are the better. We will have a go at trying to find it from the Observatory, we maybe able to see it in our “West Window”( a break in the trees to allow for objects when the ecliptic is low) on Saturday 16th December, from about 21:45hrs AEDT, although it will be only 20.6 degrees above the horizon at it’s highest altitude at 21:59hr AEDT. Viewing of other objects as well.